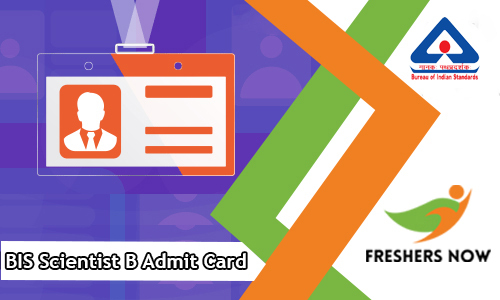 BIS Scientist B Admit Card 2018-2019: The officials of the Bureau of Indian Standards (BIS) has released the BIS Scientist B Admit Card 2018-2019 on its official web portal. Therefore, applicants who are waiting to download the BIS Scientist B Hall Ticket 2018-2019 can get it from the below-given link. Moreover, we have provided all the details related to the BIS Scientist B Admit Card 2018-2019. In addition to this, we have gathered the BIS Scientist B Exam Pattern 2018-2019 and BIS Scientist B Selection Process 2018-2019. So, candidates can refer this article to get the current updates. Furthermore, we have given detailed Steps To Download The BIS Scientist B Call Letter 2018-2019. Hence, competitors who completed their registration process can know the information about the BIS Scientist B Hall Ticket 2018-2019 from this post. BIS is going to conduct the written examination for the eligible candidates. And, to participate in the test BIS Scientist B Admit Card 2018-2019 is the important document. So, aspirants need to carry their BIS Scientist B Call Letter 2018-2019 without fail before going to the exam. Therefore, we have provided all the details regarding the BIS Scientist B Hall Ticket 2018-2019 in this article. Moreover, we have given the direct link at the bottom of this post to download the BIS Scientist B Call Letter 2018-2019. So, the contenders need to be ready with their application number and date of birth. Hence, candidates can also know the Importance Of BIS Scientist B Hall Ticket 2018-2019. The particulars of the BIS Scientist B Admit Card 2018-2019 are mentioned in the below-provided table. Therefore, candidates can refer the table to get the clarity about the BIS Scientist B Hall Ticket 2018-2019. The Bureau of Indian Standards (BIS) organization is planning to recruit the young and dynamic aspirants for the Scientist B positions of 109 vacancies. Therefore, applicants need to apply for the BIS Scientist B Recruitment 2018-2019. And, the applications need to submit after 16th March 2018 and before 02nd April 2018. Moreover, we have provided the link to register for the BIS Scientist B Recruitment 2018-2019. So, aspirants can find all the details on our website. Furthermore, in the below sections, we have given the details about the BIS Scientist B Examination 2018-2019. By clicking the below-given links candidates can know the details of the BIS Recruitment. The authorities will release the BIS Scientist B Admit Card 2018-2019 before the 10-15 days of the examination date. Therefore, applicants need to check the latest updates on our website. Moreover, the exam will conduct on 15th April 2018 for the applied competitors. Meanwhile, contenders need to concentrate more on the preparation. For the sake of applicants, we have arranged the BIS Scientist B Syllabus 2018-2019 and BIS Scientist B Previous Papers on our website. Based on the given material candidates can start their preparation for the exam. Furthermore, for the Scientist B position, there will be massive competition. Therefore, aspirants need to score the good result to get posting in BIS as Scientist B. Applicants before starting their preparation need to know the BIS Scientist B Exam Pattern 2018-2019. Therefore, we have given all the details in this section. The exam is of objective type question that is multiple choice questions. Moreover, the test includes four sections Reasoning, Aptitude, English and Technical Knowledge of Concerned Discipline. Each section contains 50 questions for 50 marks. The time duration of the examination is 120 minutes. And, the overall test is for 200 marks. Furthermore, 0.25 score will be reduced for the wrong answer. Therefore, applicants need to answer the questions carefully. So, contenders can start their preparation based on the given exam pattern. Moreover, the exam will be conducted in online mode that is the computer-based test. The aspirants who submitted their applications before the last date need to attend two rounds of selection process. Moreover, at the time of Interview, the BIS management will ask to submit more necessary documents to the organization. Therefore, applicants need to verify all the certificates before going to the interview. To participate in the written test, the competitors need to carry some particular documents to the examination hall along with the BIS Scientist B Admit Card 2018-2019. Moreover, the certificates will help for the validation purpose at the time of examination. The documents need to be carried PAN Card, Aadhar Card, Voter ID, College Identification, Photograph, Driving License or any other proof issued by the government. The BIS Scientist B Hall Ticket 2018-2019 contains the information related to the candidate and the examination. Hence, the admit card includes the details which are mentioned below. To get the BIS Scientist B Call Letter 2018-2019 the contenders need to the procedure. Therefore, we have provided the step-wise procedure in this section. Tii now, the authorities of the BIS has not yet released the status of the BIS Scientist B Admit Card 2018-2019. So, candidates need to stay tuned to our website freshersnow.com for the latest updates.